Following a mediocre remake of the classic original in 2001, the Planet of the Apes series entered a further hiatus and soon returned with an unexpectedly brilliant reboot in the form of Rise of the Planet of the Apes in 2011 - both a successful return to form for the series and a huge landmark in the field of motion capture CGI, with Andy Serkis helming things as protagonist Caesar. Many who disregarded motion capture as traditional acting found their minds changed quite abruptly, and the same newly set standards also applied to the overall quality of the series and made sequels both welcome and even necessary in many ways. 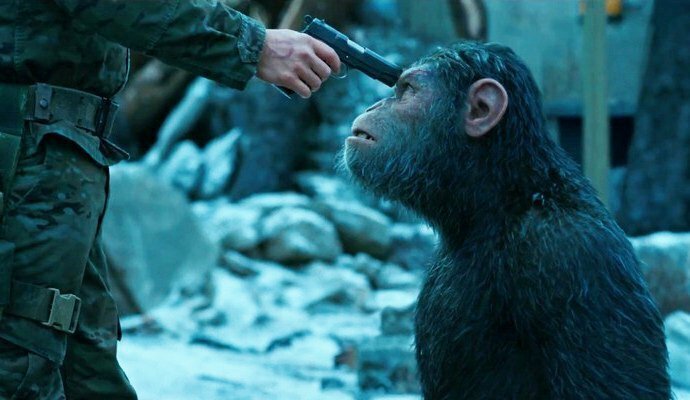 Following on from Dawn, the relationship between the newly formed intelligent apes lead by Caesar (Andy Serkis) and the surviving humans has reached a state beyond repair and war has been promptly declared, with the humans now helmed by their mysterious, power hungry Colonel (Woody Harrelson). Despite Caesar's mercy towards the attacking humans and the insistence that peace can be achieved, his actions are rejected and his tribe continuously threatened, forcing him to take actions not only to save his family but also put a stop the humans and their lust to become Earth's dominant species once more. 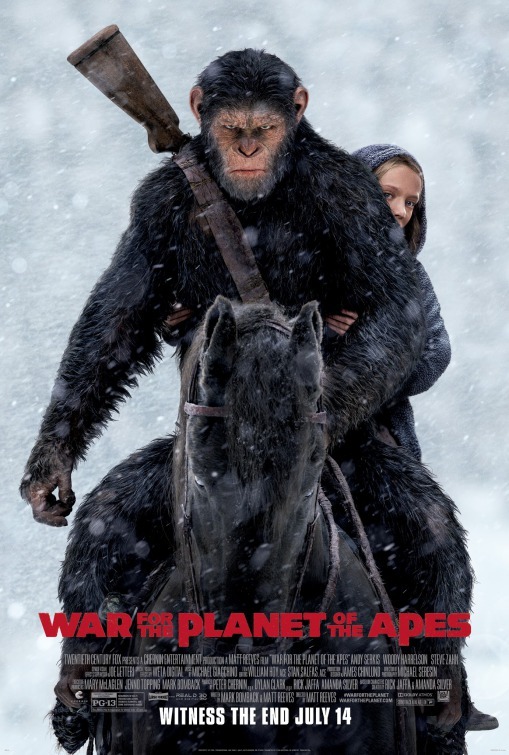 First thing that obviously must be discussed are the special effects - War for the Planet of the Apes is arguably one of the most visually impressive films in recent times, building upon the already stunning motion capture techniques utilised in it's predecessors to create the primate characters with genuine emotion and lifelike mannerisms. Not only is everything beautifully rendered with a sharp level of detail, but the aforementioned motion capture effects make them more lifelike than ever before. They largely communicate via sign language, once again translated via subtitles, but the level of emotion injected into their behaviours make them mesmerising to watch every time they appear on screen, and so the quieter scenes with little talking and more gesturing never feel awkward or tedious to sit through - if anything they make up some of the films' most emotionally stirring moments. But of course it's the performers who bring this all to life - Serkis being the star of the show for sure, but the talents of Steve Zahn, Karin Konoval, and Terry Notary (just to name a few) mustn't go unappreciated; their performances certainly aid the already stellar effects to set new standards for CGI in modern cinema. The pace of the film is what helps capture their acting so beautifully but also keeps thing very tense and atmospheric - large scale set pieces are kept to a surprising minimum, though this actually supports the film in becoming a more engrossing experience. The plot also tackles some very dark themes things progresses, which bolster the story into something far beyond even the already promising initial expectations. Though his screentime may not be as long as is normal for a strong villain, the overall development of the Colonel himself certainly override these minor setbacks to make him a surprisingly intimidating and memorable foe, thanks to some very strong writing and a superb performance by Harrelson himself. Not only are his villainous actions perfect in crafting him as a villain we love to hate, but his motivations are surprisingly thought provoking, and in some ways it helps us almost see why he does what he does - something that's never easy to pull off with a nasty antagonist, but one War masters in an exceptional way. The climax, while ending a little abruptly, is still incredibly exciting and thrilling to watch, feeling like much more than a generic, bombastic set piece that a lot of summer hits like to settle with. Without a doubt, War for the Planet of the Apes is a masterful conclusion to one of the best reboots in modern cinema, and certainly worth a watch for people who don't even consider themselves diehard fans of the overall franchise.